Jay Feely says moving the extra-point back would create a more dangerous play. 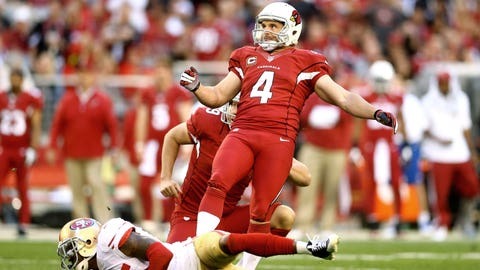 Jay Feely missed the public outcry to change the extra point. He didn’t hear players or coaches clamoring to make the play more interesting, nor did he hear widespread griping from fans and media about how boring the play is. Which is why the Arizona Cardinals kicker is awfully confused by the NFL’s competition committee toying with the idea of moving the kick back to make it the equivalent of a mid-range field goal. "It’s definitely something that’s organic at the league office they’ve generated and they desire to change. I don’t think there needs to be a rule change," Feely told FOX Sports by phone Tuesday evening. "But obviously they have a desire to explore it. So if you’re going to take out the extra point, this is a much better option. If it’s an either-or, it’s a much better option to move it back and make it more difficult." NFL.com reported Monday the competition committee discussed moving the ball to the 25-yard line following touchdowns, which would mean extra points would be 43-yard attempts. However, a source told FOX Sports the committee then discussed moving the ball to the 20-yard line instead. That would mean an extra-point kick would be 38 yards. Based on the track record of current NFL kickers, the difference in probability would increase from about 80 percent to slightly less than 90 percent. Two-point attempts would still be tried from the 2-yard line. The source said the committee has discussed using the 38-yard kick for one or two preseason games this upcoming season to test it out. Twenty-four of 32 owners would have to approve the change if it’s presented for a vote at the league meetings later this month. Even critics admit the change would instantly make the extra point more exciting. And though it would make kickers’ jobs much more difficult, even they understand the reasoning behind the league’s wanting to decrease the 99.6 percent conversion rate. "It would make the game more interesting for sure," said Dan Carpenter, who spent last season with the Bills and is slated to be a free agent next week. "You score a touchdown and half the team isn’t even looking. Half the people in the stands get up to go to the bathroom after a touchdown. They don’t even watch extra points. It would definitely make it more interesting on that point." After a pause, Carpenter added, "It would be a little more stressful for us kickers, probably." So is the stress worth the excitement? "If I had the choice, and they actually valued what Dan Carpenter thought about the whole situation," Carpenter said, "I guess I would have to vote it would stay the way it is." It’s more difficult for kickers to accept this rule change because, unlike others in recent years, it’s not about safety. The owners voted to move the kickoff up to the 35-yard line to reduce the number of returns. They also limited the wedge to a maximum of two players joining hands. They reduced the number of players a team could have on one side of the ball for an onside kick. They prevented players from lining up over the snapper on placekicks. And they made the coverage teams line up no farther than 5 yards from the ball for a kickoff, thus limiting their running start. All of those changes were done with head and neck injuries in mind. Changing the extra point isn’t about safety. "It’ll do the opposite of what they did on the kickoffs. It’ll create a more dangerous play," Feely said. "You’ll have guys who rush harder. They (currently) take the extra point off because it is a given, so guys don’t rush nearly as hard on the extra point as they do on a field goal. If you’re at a 43-yard extra point, they are going to rush hard because they do know they have a chance to impact the kick." Feely also believes plenty of coaches would be tempted into going for two, especially late in the season in cold-weather climates such as Green Bay and Pittsburgh, where footing is often an issue for kickers. "Coaches will be scrutinized a lot more on whether they went for two or should have kicked the extra point," he said. "There will be a lot of strategic things that, if you do implement this, coaches will have to understand and work through and wade through. That play will not just be an after-thought. It’ll be something looked at and dissected and something you’re held accountable for." That’s the point – to increase the drama. The Cincinnati Bengals’ Mike Nugent understands why the league wants to, as Feely put it, impact the kick. Like most modern-day kickers, Nugent has been working at his craft since his elementary school days. All of those years of practice, as opposed to players of the past who only dabbled in kicking until college, means much more accuracy. "So however you can spice it up a little bit and make certain things more relevant, I think that’s great," Nugent said. "It’ll definitely make the game more interesting. Once you get the wind and some cold, things could change around even more. It would definitely spice things up a little bit. No one will take it for granted, I guess." The Packers blocked one of Nugent’s extra points last year, but he believes the other 52 he made would’ve been good from 38 or 43 yards. A non-blocked extra point is so automatic for him that he simply tries to pick out a spot behind the net – e.g. a part of the scoreboard – and tries to hit it. Feely uses the extra point as "in-game practice," meaning he’ll work on his form in anticipation of a longer kick later in the game. Carpenter notes the biggest challenge for a kicker might be a 38-yard kick following an unexpected touchdown, such as a long offensive play or a defensive score. "At that point in time, warming up hasn’t even been a thought process for me," he said. "Usually that’s not a big deal because I can run over and get one quick one into the net, if I need to. I know I can run out and it’ll only be a short 20-yard field goal for a normal extra point. But now, if he breaks it for 80 yards, I have to go out and kick a 38- or 43-yard field goal, whatever they decide on doing. That definitely changes what your thought process is going to be." Many kickers like how making an extra point early in the game gets them in rhythm for the rest of the day. A nice, easy kick without any pressure can allow them to go through the entire operation in a game situation. With a rule change that makes the kick tougher, they might suddenly be out of rhythm. Nugent is among those who would embrace the challenge. "If you’re going to let that kick affect you the rest of the day, it definitely will. But I think guys are so much mentally stronger these days," he said. "Sometimes things are going to go wrong. If and when they do, how can you bounce back from that? That’s one of the biggest things for any position. How do you come back from something that didn’t go perfectly?" If some owners and members of the competition committee get their way, that will be a question many kickers will one day face.